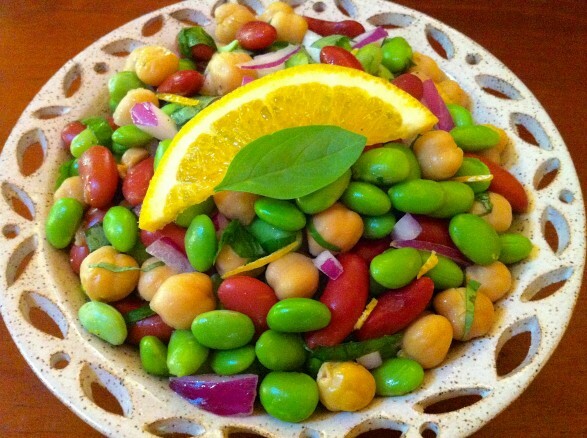 Even those who claim they don’t care for bean salad have been known to have seconds of this super simple salad. 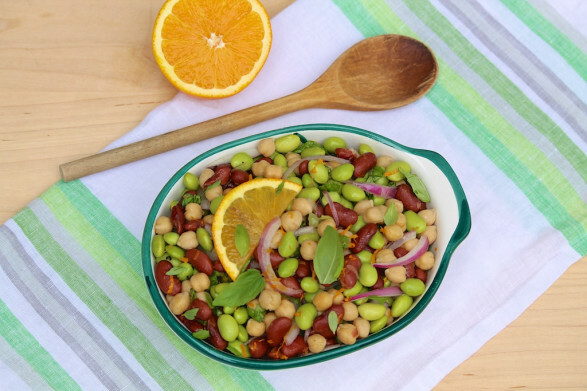 Although lima beans are a fitting option, I typically use edamame as the unexpected third “bean” in this take on the traditional three-bean salad. A delightful side dish to grilled chicken, steak, or pork barbecue, I also frequently serve this recipe with curried chicken salad and some slices of quick bread or crusty rolls. It makes for a cool, fresh-tasting meal, and everything can be prepared in advance. Coincidentally, the last two salads I’ve posted include citrus zest in the ingredient list. For many years, I forewent a zester because I didn’t want one more gadget to clutter my kitchen drawers. When, on occasion, I used zest in a recipe, I peeled the colorful skin (avoiding the white “pith”, as that is bitter-tasting) with a potato peeler and then minced it. And then a few years ago, I spontaneously bought a Microplane. For those who may not be familiar, this is a long, thin grater that originated as a smoothing tool for woodworkers and has proved to be an indispensable kitchen tool for its ability to efficiently grate the likes of citrus zests and Parmesan cheese. A good version of this handy gadget runs about fifteen dollars. It quickly became one of my favorite tools, and I began incorporating the zest of lemons, limes, and oranges in recipes far more frequently. With the right tool, zest can add loads of flavor with little effort. When to use it? Zest is ideal anytime a stronger citrus flavor is desired but without the additional liquid or the inherent tartness more juice creates. This fragrant outer layer of the peel offers a little “something extra” – a fresh flavor well suited to any salad or marinade that already calls for the citrus juice. Likewise, zest compliments a wide variety of non-citrus flavors. Try including the zest of one lemon in your favorite blueberry muffin or pound cake recipe. Similarly, lime zest and strawberries have an affinity for one another—something to consider throughout the local strawberry season. For a tropical twist, I like to use the zest of one lime in my favorite recipe for Strawberries and Cream Baked Oatmeal and sprinkle a little shredded coconut on top. For a hint of crunch, I sometimes scatter a handful of pumpkin seeds (pepitas) over the top; sunflowers seeds are a flavorful option, too. A sprinkle of crumbled feta is, likewise, purely optional but will provide a different dimension to the flavor. Both the seeds and cheese are best added just prior to serving. Yields approximately 1 1/2 quarts. Mix the cooked and cooled edamame and the two beans in a large mixing bowl. Add the onions and basil, and stir. In a small bowl, whisk together the oil, juice, zest, salt and pepper. Pour the vinaigrette over the bean mixture, and toss well. Toss again before serving. Taste for seasoning, adding a little more salt and pepper, according to preference. (Also, the sodium level in different brands of beans varies greatly. Rinsing will remove much of any added salt, but not all.) As an option, garnish with a few thin slices of orange and some basil leaves. For a different flavor profile, I occasionally make this dish with a cilantro-lime vinaigrette instead of the basil-orange combination. To mix it up, simply swap the herb and citrus ingredients in equal amounts. 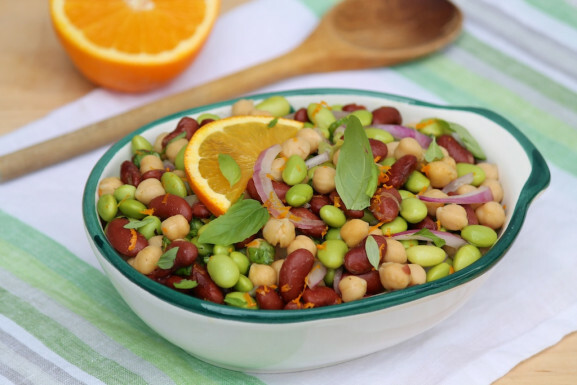 Beyond substituting lima beans for the edamame, you could also experiment with black beans in place of the kidney beans. Follow The Fountain Avenue’s board Salads on Pinterest. Wow, I love that basil-orange flavor combo! My family likes the orange with basil and I make the cilantro lime version for my lunches. I am happy we all enjoy this awesome healthy meal. Thought it was about time that I left a comment! I’m glad you all like it, too, Kaci. Thank you for taking the time to let me know!